Sandy Felton talks to Lucie Oldale, a skilled horticulturist at the Eden Project, who works in the Rainforest Biome, where she looks after orchids. If you love orchids you will love the orchid wall in the popular Rainforest Biome at Cornwall’s Eden Project. This dazzling exhibit – with a living display of over 200 orchid plants featuring 52 different species, is a celebration of these fascinating flowers and will enchant visitors to the tropical biome where they are displayed with thousands of plants. July 2018, saw the launch of the Orchestra of Orchids display in the Bamboo House, (also in the Rainforest Biome) where a range of 500 flowers exuding an array of captivating scents, is on display. There are currently more than 60 species in the genus Phalaenopsis, mainly from tropical South East Asia, with a species hot spot in the Philippines and with some growing as far north as the Himalayas. Orchids have become very popular in the last few years with more and more people appreciating these fascinating and beautiful plants. The living wall was planted with the help of students from Writhlington School, Radstock, Somerset, last summer. The school has a nationally important collection of orchids grown from seed as part of the Orchid Project run by teacher Simon Pugh-Jones. Funds raised from selling these rare and often endangered plants, help fund student expeditions around the world in which they propagate the species with the help of local children. They won’t re-pot their orchids into new pots as they will be rotating the display in the Bamboo House to make sure of a long-lasting floral display but once the current orchids have finished flowering they will be planted elsewhere in the tree tops in the biome entrance for a naturalistic display. These displays will pave the way for an even bigger celebration by way of an Orchid Festival, which the Eden Project hope will take place in 2020. With over 28,000 species of orchid around the world, often living on larger plants or trees and enjoying mutually beneficial relationships with other such biota, they are known for their medicinal benefits as well as playing a key role in the ecosystem. Many people think that growing and looking after orchids is difficult but this is not the case so we asked Lucie Oldale, a skilled horticulturist with the Eden Project, to give us some tips on growing and looking after these beautiful plants and how they approach their care in Eden’s Rainforest Biome. 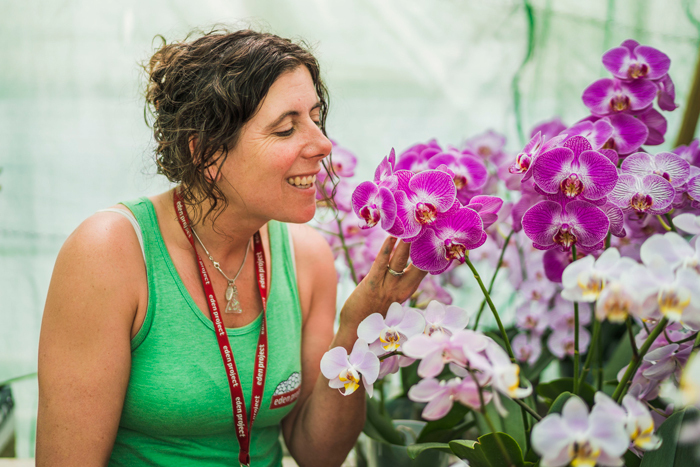 Lucie explains that they water their orchids over the hot summer months twice a week – very gently concentrating on the roots and taking care to avoid wetting the petals. Many orchids prefer high humidity but the roots should never be sitting in water. 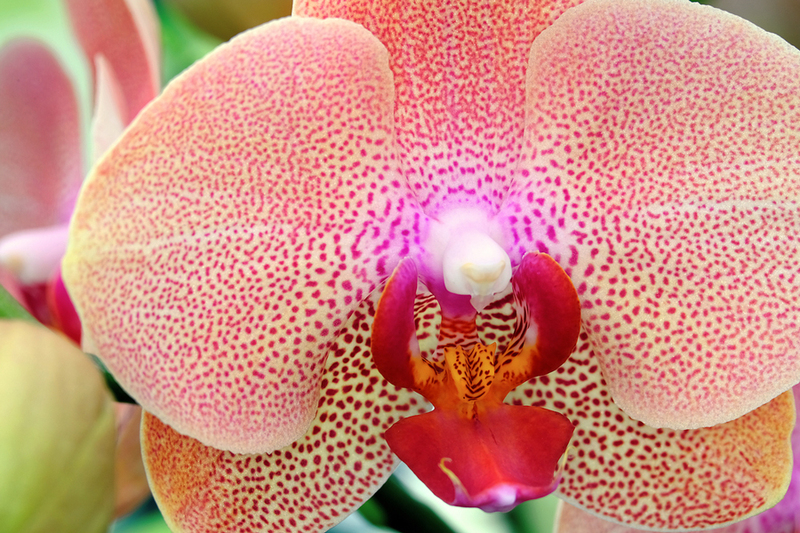 To know if an orchid needs watering you should check the moisture levels of the bark and look closely at the roots. Phalaenopsis roots are actually photosynthetic so when they are moist the tips are green, as they dry they turn silver – this is a good indicator of the need for water. One question often asked is how much light orchids need especially in the case of the Eden Project where there are so many? Lucie points out that growing orchids in the right location and position is the key to a happy plant: “Many tropical orchids prefer diffuse light. It has been a long sunny summer which has been great for plants in general in the biome! The ETFE our biome is made from diffuses the light reaching our plants. Our orchids are planted in the shade of our giant bamboo which stops them from receiving too much sunlight. This type of orchid only requires around 4-6 hours of sunlight per day so they are planted in a great position,” she added. One of the biggest challenges in caring for so many orchids is keeping them correctly watered when the biome is hot and keeping the exhibit looking its best when thousands of visitors come to see them: “Orchids are fragile and the flower spikes can be easily damaged, but luckily our visitors are very considerate and enjoy the immersive experience with care,” explains Lucie. Orchids have few pests but aphids, mealy bug and thrips will cause damage so bio control is used to combat these. Other insects are also released which either consume or parasitize the pests to control the pest population and keep the orchids happy. 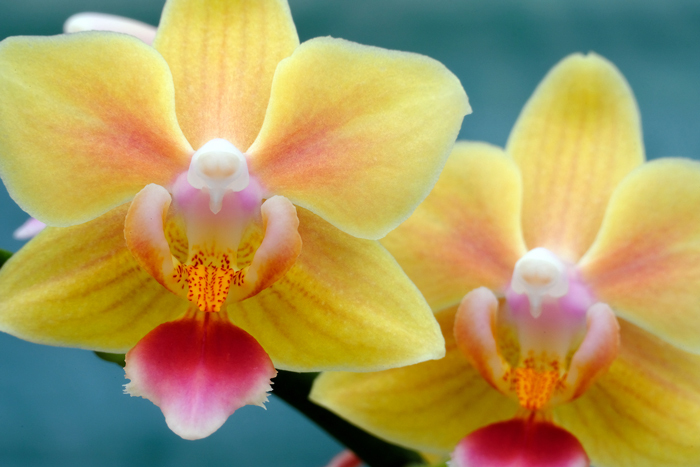 Phalaenopsis orchids will need feeding but they don’t require as much fertilizer as other house plants. At the Eden Project they use a general purpose orchid feed diluted and sprayed onto the leaves and roots of each orchid every two weeks. Over winter, this is reduced to once a month. Obviously, as orchids come from all over the world, some species from the tropics require very high heat and humidity whereas others from more temperate regions or high altitudes are happy with cooler temperatures and lower light levels. Also, some grow in soil, others in tree tops and some even need to be near standing water. One last tip from Lucie is don’t water the flowers! Research your plants well and purchase from a reputable and preferably local grower. Our thanks to Lucie for her interesting information and tips in caring for these delightful and beautiful plants. All photographs strictly ©The Eden Project: Banner above: optimum angel; middle sunny smell.